Electric string trimmers offer a convenient way to trim your lawn after mowing it, resulting in a professional, well-manicured finish that you can be proud of (and which may make your neighbours envious). Lawn mowers often fail to cut the grass growing along the edges of a lawn properly, since the grass often grows sideways in this area – thus requiring you to trim or edge along the perimeter of your lawn. 2-speed control for more power or extended runtime. Maximum initial battery voltage (measured without a workload) is 20 volts. Nominal voltage is 18. While edgers are designed to trim a lawn along a hard surface (e.g. driveway or sidewalk), trimmers are more versatile and can be used alongside hard surfaces, in tight spaces and along planting beds. But tools will leave behind grass debris, clippings and dirt that you will need to clean up after the trimming process. There is a wide variety of edgers and trimmers, ranging from simple handheld clippers to gas and electric models. Unlike gas-powered trimmers, using electric string trimmers doesn’t involve much noise, dealing with pull-string starts, or the inconvenience of having to achieve the right fuel-to-oil ratio. 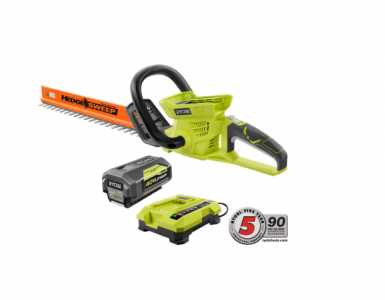 This article provides a helpful overview and quick reviews of the top 5 electric string trimmers that will help you achieve and maintain the lawn of your dreams without too much effort, hassle and expenses. 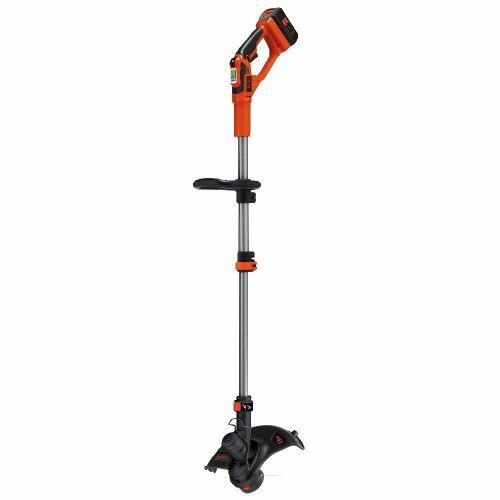 The BLACK & DECKER LST136W 40V is slightly heavier than the GreenWorks 21212 and the Makita XRU02Z, weighing in at 9.9 pounds. With its PowerDrive Transmission (which delivers more power from the motor to the cutting string), 40V MAX* lithium battery (which provides lasting power; the battery is included) and PowerCommand dial (which allows you to choose between max power and max runtime), it successfully achieves a great balance between power, performance, effectiveness, lasting battery life and affordability. If you need to trim thick weeds or dense overgrowth, you can set it to maximum power. If you’re planning to trim along the perimeter of a large lawn, you can set it to maximum runtime and conserve battery power. The battery comes with a real-time LED system that indicates how much battery power remains. If you plan to trim for prolonged periods of time, buying a second battery may be a worthwhile idea. Its Automatic Feed Spool allows you to work continuously without bumping, and you can easily convert it into an edger with an easy turn of the shaft. Meanwhile, the telescopic handle allowing you to adjust the length of its handle to suit your needs. The BLACK & DECKER LST136W comes with a 3-year warranty. 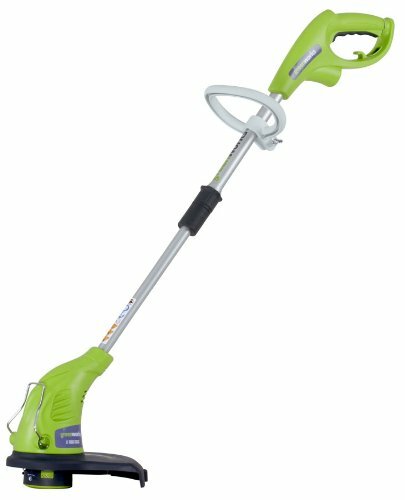 Weighing only 7 pounds, the GreenWorks 21212 allows you to trim small and medium-sized yards with ease – the electric start allows you to start working within seconds (the power chord is not included, however). 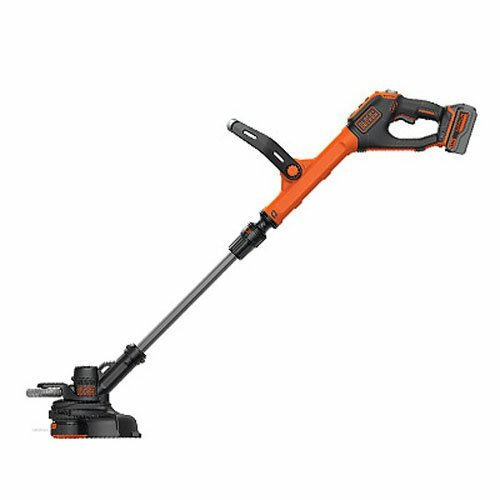 With its 4 amp motor, .065 dual line auto-feed, and adjustable auxiliary handle, it makes a 13-inch cut path without contributing to all the pollution caused by gas-powered trimmers. It also comes with a rotatable shaft, allowing it to be transformed into an edger. 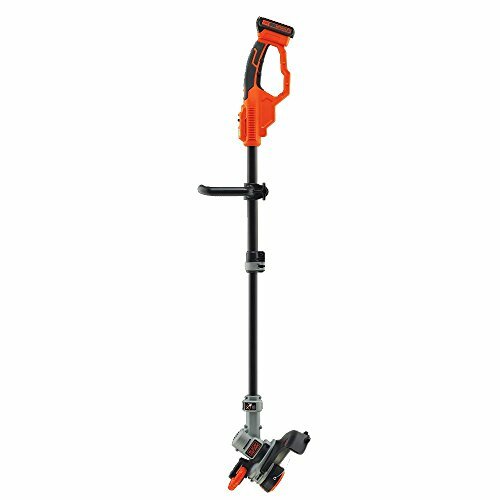 Its telescopic shaft allows you to increase the length to an additional foot, allowing it to accommodate users of different heights. It may not be ideal for users over 6’4’’, however. The cheap price may prompt concerns about quality – rest assured that GreenWorks 21212 was engineered to be sturdy and durable, can handle thick and tall grass without problems, and comes with a full 4-year warranty. With a three hour (32V) battery life, the Worx WG175 provides power and longer running time and a variety of functions: trimming, edging and mowing. 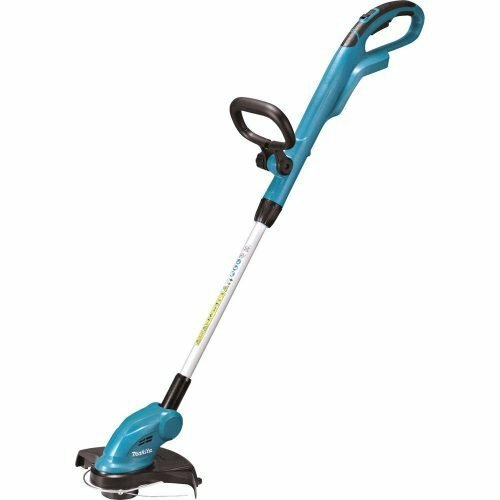 It comes with a wide 12-inch cutting swath that allows you get all your trimming and edging (it converts into an edger in seconds, all you need to do is pull the trimmer head and turn to lock it) done easily. Weighing only 6.2 pounds, it is also one of the lightest electric string trimmers on this list. It provides a 12-inch cutting diameter with an automatic 100% single line feed (no bump), and comes with a quick-release lever that allows you to adjust the height of its telescopic height easily. 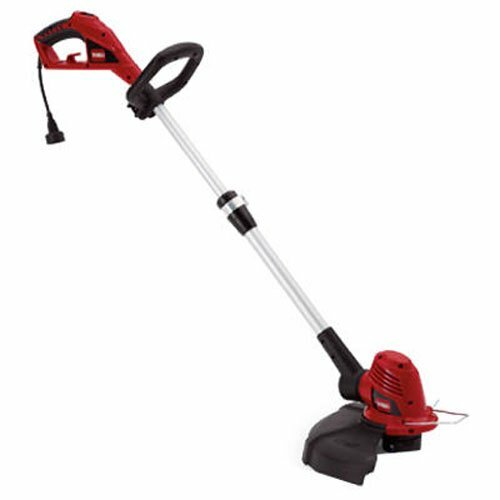 Its front auxiliary handle also has 7 locking adjustments, providing maximum comfort when you’re trimming, edging, or mowing. It comes with a three-year limited warranty. 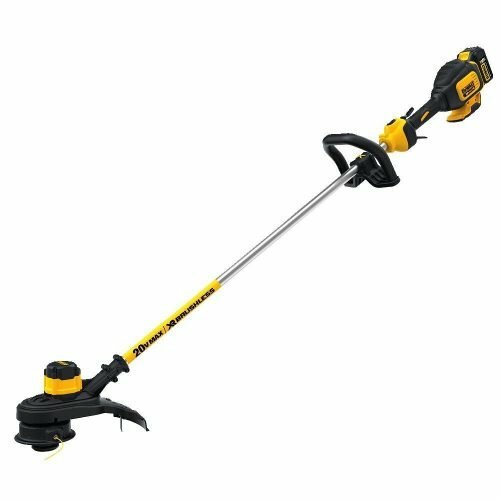 The DEWALT DCST920P1 is a cordless string trimmer (powered by a 20V lithium-ion battery) which has a 13-inch cutting swath and a convenient bump feed system. 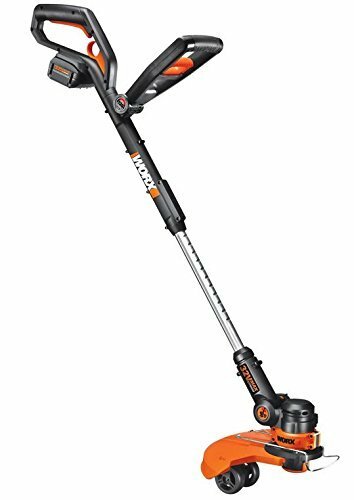 It is relatively light (8.5 pounds) and comes with a long, non-adjustable shaft (65 inches) – this may suit taller users well, but may be inconvenient for shorter users (i.e. those below 6 feet in height). With its brushless motor and patented gear drive design, the DEWALT DCST920P1 promises more torque, high cutting speeds even when dealing with thick overgrowth, and an increased life span. It has two power modes: high and low, allowing it a maximum of 4600 RPM on the low setting and a maximum of 6000 RPM on the high setting. The trigger allows you variable speed control, without exceeding the setting’s maximum RPM. Naturally, battery endurance is lower when you use it with the high power setting (continuous running allows the battery to last for approximately 20 minutes on the high power setting and 40 minutes on the low power setting). The DCB101 charger takes about 45 to 60 minutes to fully charge the 20V lithium-ion battery. While the DEWALT DCST920P1 provides high power and maneuverability without much noise and vibrations, it cannot also double as an edger. It comes with a 3-year limited warranty and a 1-year service warranty. The Makita XRU02Z comes with a built-in motor that delivers 7,800 RPM for faster cutting speed and performance. 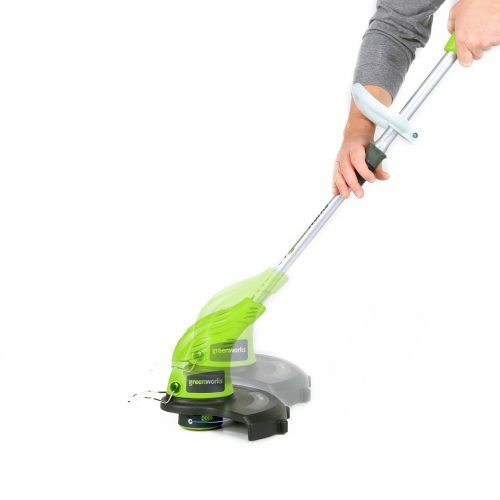 Like the GreenWorks 21212, it is relatively compact and light (only 6.4 pounds with battery, which is sold separately), making it suitable for trimming and precise edging. Its adjustable 5-position pivoting head allows you to adjust the cutting angle when trimming in tight spaces, while the telescoping shaft allows you to adjust its length (from 48-1/2″ to 56-1/2″) to achieve an optimum cutting position. The Makita XRU02Z also comes with several other features that enhance user convenience: an easy-loading bump and feed trimmer head; an adjustable loop handle; a built-in lock-off lever; a battery capacity warning system (with an indicator light) that automatically stops the motor and notifies you when it is time to recharge the battery; Star Protection Computer Controls™ that protect against overloading, over-discharging and over-heating; a Rapid Optimum Charger that communicates with the battery’s built-in chip while charging to optimize battery life by controlling current, voltage and temperature comes with a built-in fan to cool the battery while charging; category-leading charge time that allows the battery to spend more time working and less time sitting on the charger. Do note that the battery and charger are sold separately. As with the GreenWorks 21212, the Makita XRU02Z produces zero emissions and saves you the hassle of using gas or oil. It comes with a 3-year limited warranty. 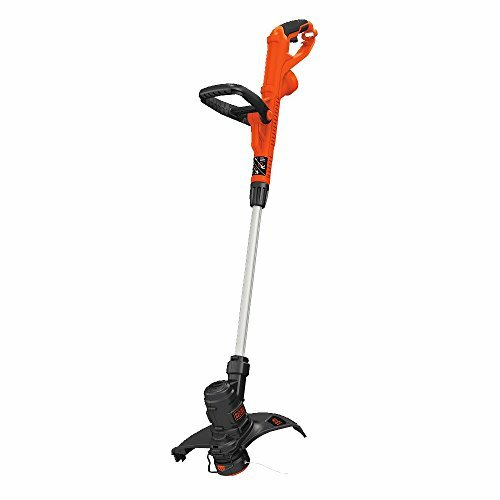 Which electric string trimmer makes the best addition to your gardening toolkit? This ultimately depends on how much power you need from all your trimming and edging work, and the variety of uses you plan to use your trimmer for. While you can order all these products online, it might be prudent to see how compatible they are with your height at a hardware store. With the right choice of purchase, the perfectly manicured lawn of your dreams can be attained without sacrificing too much time, effort and money.